Every day, yoga grows more and more popular. Currently there are an estimated 20.7 million people who practice yoga in the US alone. Were you to ask any one of them why they practice, you would see some definite themes but you would also get a unique twist on those themes. 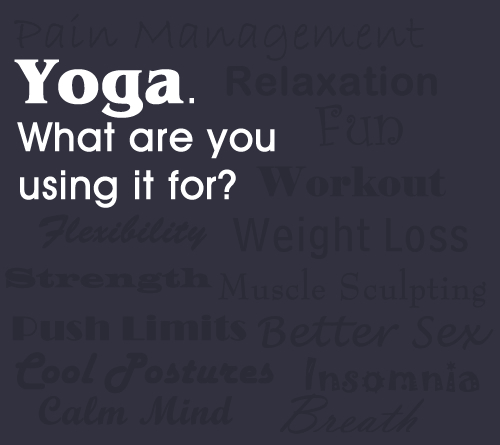 The best part is that you would quickly realize that there is really no one right reason for practicing yoga. At the same time, you might realize that while there is no one right reason for practicing, there is a subtle yet distinct progression in the practice. Looking at the list above, it is fairly easy to see the progression from externally focused reasons to internally focused reasons. My favorite is using cool postures to impress others. Once, a very muscular man interrupted my personal practice at the local community center and said, “Teach me some cool yoga poses so I can impress my girl.” It would be very easy to say his reason for yoga was an unworthy one but why? Aren’t we all using yoga to help us get what we want? I studied with one teacher who would have said this man’s reasons for yoga were kindergarten—even preschool—reasons for yoga. It seems insulting to call someone’s reasons for doing something kindergarten level, doesn’t it? If a 5 year old came up to you and said, “Teach me some cool yoga poses so I can impress my girl,” how would you react? I would chuckle and teach him some cool yoga, probably tree and dancing Shiva, like I did the muscly man. A 5 year old might not know better reasons for doing yoga, the same holds true for the muscle man; so, give them both the same encouragement and try to give them more, not better, reasons to practice. If there is a preschool level of yoga, is there a masters or doctorate degree program? Is there an ultimate reason for practicing yoga? Classes are often billed as beginners, mixed levels, intermediate or advanced. What does that mean, really? Yes, there is an ultimate reason for practicing yoga. Look at the picture below, can you pick out the advanced yogi? Extreme flexibility, strength and even amazing postures are not evidence of an advanced yogi; rather, they are evidence of someone who is either naturally gifted with these things or who has worked very hard to attain these things. Such dedication is amazing to behold and can be very inspiring. It is not, however, evidence of an advanced yogi. It is not even evidence of yoga. The fellow with his head between his feet may be wondering why his feet smell like they do while the guy in warrior is hoping his feet don’t slide. The partners in the third shot might be hoping the photographer finally gets the shot and the man moving into handstand is hoping to impress the girl with the white headband. All while the man in shavasana is really just taking a nap. Or not, we have no way to measure or know. Yoga is Union. That is the doctoral thesis of this whole practice. If you master those three words, “Yoga is Union,” then there is no more. If you think that this Union means bringing some separate things together, then you still have a bit of study yet. Want to know more? Good, come to my home tomorrow night at 7pm. Check out FaceBook for details. Can’t make it tomorrow, not to worry. I will share some of the details on Monday.